I chatted with Aaron from Reel Big Fish about their music, and surviving the industry for so long. Q: How did Reel Big Fish form? A couple of high school kids saw a music vide for Poison’s “Talk Dirty to Me” and decided to start a band. 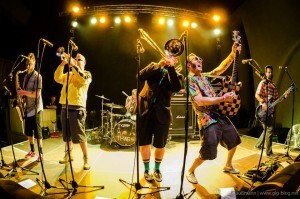 At first we wanted to play every single style of music that existed but after somehow stumbling across the Southern California Ska scene we decided that Ska Punk was what we wanted to do with the rest of our lives! it was pretty surreal being on the set of a movie and knowing that WE were going to be in it! And with the South Park guys no less! Also we filmed our scene the same day as the cheer leader scenes so that was fun to watch all day. We were also in a party scene that never made it into the movie. Q: What is your favorite song that you’ve written? It’s hard to pick a favorite, I’ve put so much time and effort and love into each one and they are all special to me in their own way. I’m really proud of our last album “Candy Coated Fury”, all those songs are amazing, definitely some of my best. Q: What is your favorite part of touring? Worst part? The best part is being able to travel all over the world and play music every night. That was pretty much the dream when we first started out, we wanted to make the band our job and the way that we make a living. We live to tour, and tour to live! I love playing shows and performing my music live, it really is a dream come true to be able to do this, especially after 20 years. It does get hard at times to be on the road so much, just spending huge chunks of time away from home and family is hard on the brain and definitely strains relationships with the ones waiting at home. The main reason that some people have left the band was mainly because they had their first child and just wanted to be around to raise it. Q: Which album of yours is your favorite as a whole? I think “Our Live Album is Better than Your Live Album” is definitely my favorite. It’s a masterpiece of comedy, musicianship and good old entertainment and fun! It wasn’t easy editing the best moments together from 8 shows that we recorded but it came out so good, and the jokes and banter between songs are priceless gems of hilarity! Q: What does it feel like having your videos played on MTV? MTV plays videos?! haha It really was weird to see myself on TV at first. It just seemed so strange, like I didn’t belong there, like we stuck out from all the other bands. But it definitely was a dream come true and was pretty amazing! Q: You guys have been in the business for a while now. What does it take to last so long? For us, it’s been a lot of hard work and constant touring. We got lucky back in the day and got a song on the radio that got a few peoples attention. But it wasn’t a million selling hit that made us rich and famous or anything. So we stayed on the road, building a reputation as a fun live band and we kept putting out records full of music that our fans love. Lucky for us, people still like to come to our shows and see our band play. So what it takes to last is definitely a lot of luck and a lot of hard work. Our fans mean everything to us, without them we couldn’t have made our dream of playing music for a living come true. The thing that makes us the most happy and gives us the greatest joy in the world is getting up on that stage and playing songs for the people who came out to see the show. 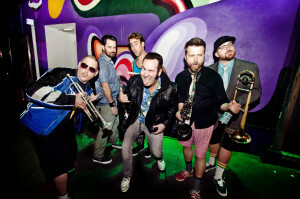 Reel Big Fish is playing The Fillmore in Silver Spring 1/31!